Does colour of skin matter? The National Solidarity Party is calling for the abolishment of the Group Representation Constituency Scheme in favour of the Constituency Reserved for Minority scheme, which it believes will give the minority its continued representation in parliament without undermining democracy. Under the CRM scheme, Singapore reverts to an all-Single Member Constituencies scheme before the Elections Department of Singapore designates a selected number of SMCs to become CRMs. In response to a question of the criteria by which SMCs are selected and assigned CRM status, NSP said that it will leave it to the discretion of the Elections Department of Singapore. “Under the GRC system, its executive, loosely known as elections department, decides where to draw boundaries and designates which areas will be considered GRCs and which areas will be SMCs. So we will leave it to the executive to do likewise as far as CRMs are concerned,” said Secretary-General Jeannette Chong-Aruldoss. “It is beyond the scope of our paper to deal with the role of the elections department for the time being, so our position is that all things being equal, the CRM scheme is still superior to the GRC scheme,” she added. The GRC scheme was put in place in 1988 to guarantee minority representation in parliament, as part of the government’s belief in multi-racialism. But colour of skin does not seem to matter as much today. 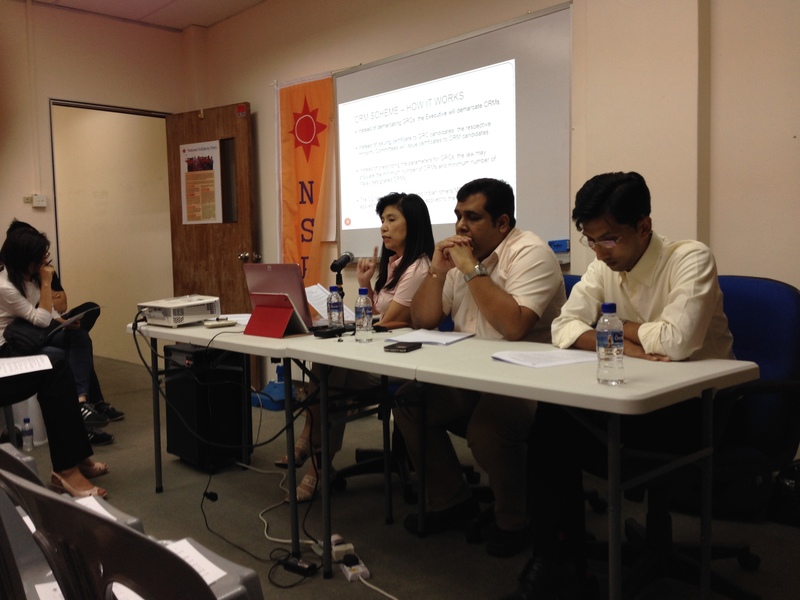 “There is a lack of evidence that Singaporeans are voting along racial lines”, said NSP activist Ravi Philemon. NSP also claims that the GRC scheme creates “unequal playing fields” by “making it difficult for the opposition to compete, especially in larger 6-man GRCS, which require a total of $81,000 in election deposits. “In addition, voters have no say in which MP is assigned to their division in the GRC,” said Philemon. In essence, the scheme entrenches the political incumbents and undermines true democracy, he said. Criticisms of the GRCs are not new – so why bring it up now? The paper calling for GRCs to be abolished – a collaborative effort of the NSP Law Committee and the Malay Bureau – was released yesterday on the party’s website. To minimise changes made to existing policies, the CRM scheme will mirror the GRC’s racial guidelines in ensuring minority representation. Currently, three out of five GRCs are required to have at least one Malay MP, while two out of five GRCs are required to have an Indian/other MP. These proportions can be applied to calculate the number of CRMs to be designated. But inheriting the existing CMIO racial categories unearths yet another question – the relevance and legitimacy of such racial classifications. “That doesn’t seem to sit well with people who want to be identified as Singaporeans, rather than by race,” she added. Amidst the clamour over whether the CRM is a superior substitute for the GRC, a bigger question surfaces: does the race of a political candidate matter within the political context of present day Singapore? It looks like NSP has missed asking that question and thus bring about a bigger discussion on the role of race in politics in a modern city state like Singapore. And this will help us re-visit the issue of the PAP continuing to say no to a non-Chinese PM.